AAS Calf Enhancer ensures coccidiosis protection from birth to weaning. Monesin has been proven effective for prevention and control of coccidiosis caused by E. bovis and E. zuernii in cattle. Calf Enhancer is designed to be added to whole milk or reconstituted milk replacer to provide an adequate level of monensin until medicated dry feed intake is sufficient to deliver an effective level. Use should begin as soon as possible after birth, when the intestinal tract is most sterile. 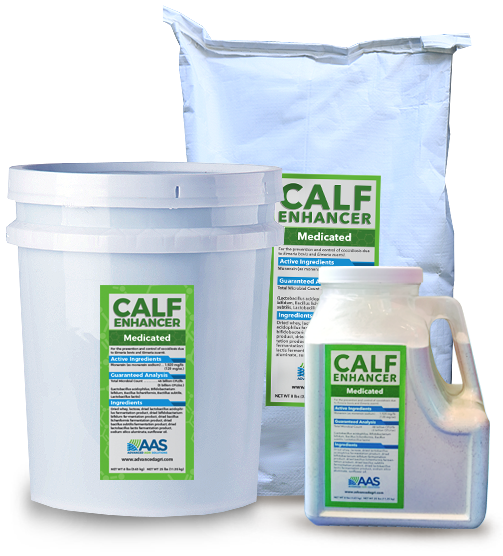 Calf Enhancer is available in a convenient 8-lb container, a 25-lb pail, and a 50-lb bag. About 2 lbs delivers protection from birth through weaning. Also includes key nutrients: Dried whey, dried L. acidophilus fermentation product, dried B. bifidum fermentation product, dried B. lichenformis fermentation product, dried B. subtillis fermentation product, dried L. lactus fermentation product, sodium silico aluminate, and sunflower oil. Mix 1 tablespoon (⅓ ounce) of Calf Enhancer twice daily with the daily feed intake to supply 80 mg of monensin per day or 0.8 mg/lb body weight for a 100-lb calf. Adjust the feeding rate according to body weight in order to provide 0.14–1.00 mg of monensin per pound of body weight per day up to a maximum of 200 mg of monensin per head per day. The preferred dosage for calves less than 300 pounds is 80–100 mg.
Calves need extra protection from coccidiosis, an infection of the large and small intestines caused by protozoan parasites. Next, learn more about how Ultra Calf Enhancer™ helps promote weight gain and feed efficiency.